24137, 24041 & 08739 at Cockshute stabling point on January 18th 1976. The fifteen year eight month career of D5137/24137 was spent allocated only to London Midland Region depots. After withdrawal 24137 was stored at Bescot from May 1976 until January 6th 1978 when it was moved to Toton for rerailing exercises. 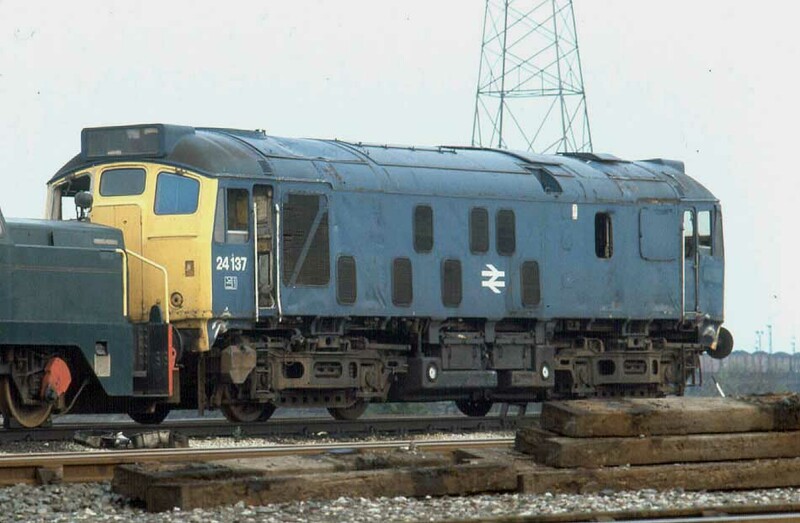 On July 27th 1978 24137 was forwarded from Toton to Doncaster Works and broken up there during October 1978. Movement: 24137 Toton - Doncaster July 27th 1978. Noted Derby Works April & May 1962. Noted Derby Works September & November 1963. Noted Derby Works February 1970. Noted Derby Works April 1972 (green livery, full yellow ends). 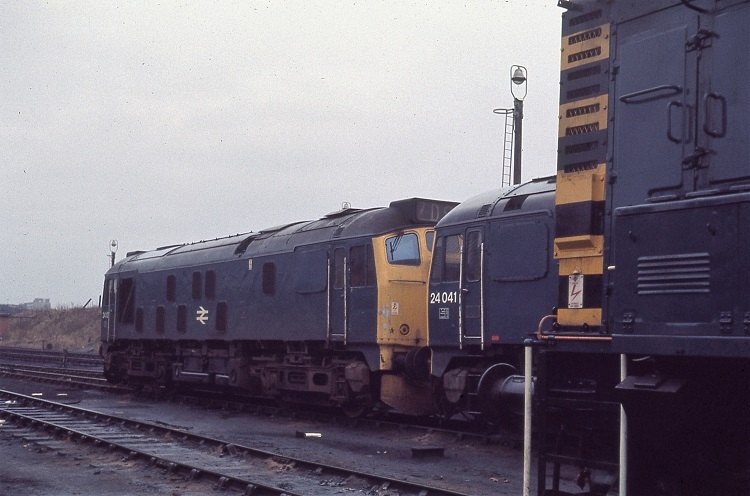 The recent arrival of a number of Type 2s at Longsight saw them working new turns, one such was the 9.35pm Huddersfield Hillhouse – Willesden Class D freight returning north as far as Northampton on the 2.50pm ex Euston, so noted have been D5083, D5134 – D5137 & D5139. By this time just over fifty percent of the passenger trains out of Euston were in the hands of the diesels, the EE Type 4s clearly dominating on the long distance expresses, with the Type 2s a distant second on the local workings. Condition January: green livery with full yellow ends, gangway doors present, shortened fuel & water tanks - both fitted with circular gauges, no blanking plates, hand/footholds plated over, ridge sided sandboxes, three-rung bogie mounted footsteps, 'D' prefix present, most valencing still present. On September 2nd 5137 and Class 08 No.3397 visited the Horsehay branch to collect a lengthy & heavy crane section from the Horsehay Company bound for Motherwell. 24137 was withdrawn on July 17th 1976. January 6th saw 24137 moved from Bescot to Toton for use in rerailing exercises, the following week it was noted lying on its side! Photograph courtesy Richard Boyd. 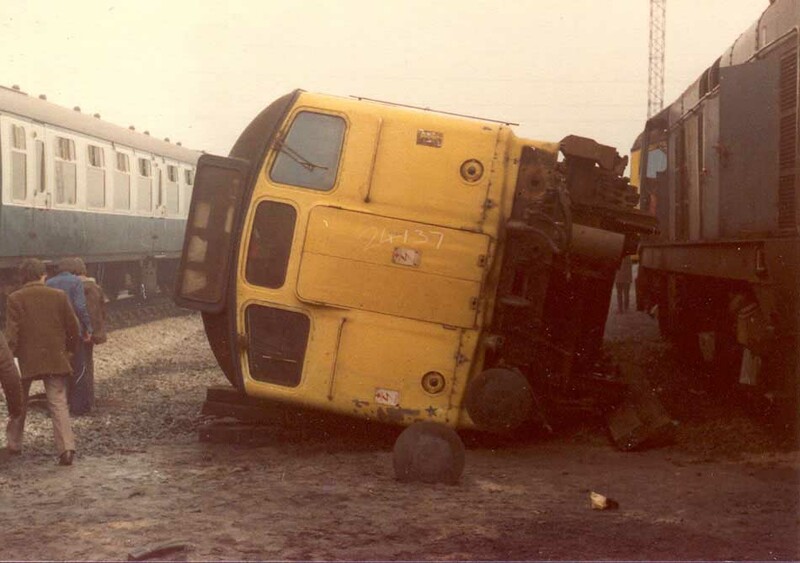 24137 on its side at Toton on January 11th 1978. 24137 retained its gangway doors until withdrawn. 24137 at the north end of Toton depot on May 10th 1978. Condition Final: blue/yellow livery, gangway doors still present, shortened fuel & water tanks -both fitted with circular gauges, blanking plates fitted, hand/footholds plated over, ridge sided sandboxes, three-rung bogie mounted footsteps. Page added August 20th 2016. Last updated February 3rd 2019.